As you begin the process of franchising your business, you will have to start putting a team in place. Well before you make your first offer to sell a franchise, you will have to have individuals tasked with marketing, sales, training, and compliance. In the early days, one person may wear many hats, but these rolls must exist irrespective of how many positions one person fills. Success in franchising is driven predominantly by the people you surround yourself with as you grow your business using the franchise model. I would take that a step further; the team you assemble at the outset will make or break your success as a franchisor. Nobody is a neutral; your CEO is either driving the company in the right direction, the wrong direction, or standing still while your competitors zoom by. Your marketing personnel are either thinking about how everything they do can drive both franchised-business level engagement and franchisor-level engagement, or they are wasting your add dollars. Your franchise sales professionals are either correctly utilizing evaluation techniques to work the right people through the process quickly and the wrong people out even more quickly, or they are burning leads, damaging relationships with referral partners, and, worst of all, recommending people to be awarded franchises that should not be in the system. Chances are that at least some of your team will be in-house, and some will be out-sourced. As you grow, you may find it more advantageous to move positions that were once in-house to an outsourced solution, or vice versa, and sometimes back again. There are three basic ways to develop your team. Many businesses have key personnel who are under-utilized. A retail store might have a sales manager that would be great at franchisee sales-training, or a restaurant may have that certain member of the wait staff that just ‘gets’ customer service and would be interested in training new franchisees on location. At the beginning, most repurposed staff will still keep their primary roll in the company as well, though they may shift to 100% franchisee focused as you grow. 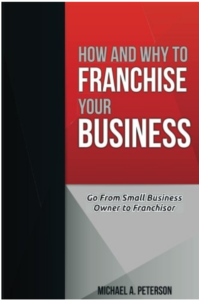 Depending on your business model and also on your personal preferences, you may have the need to hire dedicated franchisor staff immediately, or wait until franchisee growth requires it. Some franchisors see a strong benefit in hiring one key executive with franchise experience at the outset, who will then guide the franchise side of the business. When you start down the franchise path, you will most certainly outsource at least some rolls. Attorneys, marketing professionals, and graphic artists are almost always outsourced until your reach a substantial size. 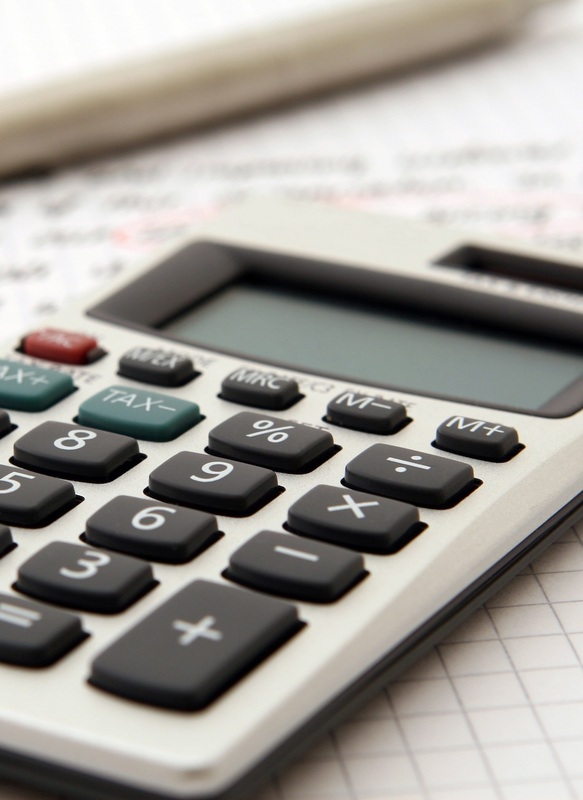 Many franchisors chose to outsource basically all franchise-ubiquitous rolls, including sales, compliance, and even accounting and royalty collection. You can learn more about picking the right franchise consulting company here, and how to choose the right franchise counsel here. Having a solid support staff is key to early success. 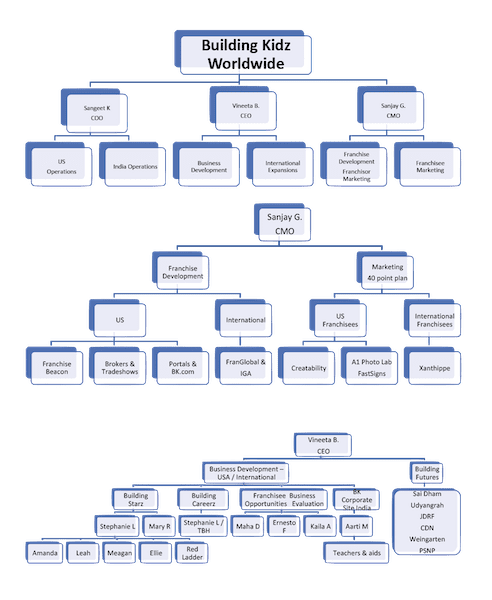 Here is an Organizational Chart series from Building Kidz Worldwide (reproduced with permission) a young but rapidly growing franchise in the preschool/early childhood education space, from when they had less than 15 units open. As a franchisor founded by individuals who had previous high-level careers complex organizations, often designing such organizations themselves, their approach was systematic. As you can see, they already had in-house staff identified, as well as outsourced relationships in place, to support a much larger system. Its a good thing, too, as they ended up nearly doubling in size that year! The choice between repurposing, hiring, and outsourcing is a fluid one. You may decide to bring marketing in-house, as an example, to maintain more brand control, or to outsource website development if you maintain websites on behalf of your franchisees. I would encourage you to seek the counsel of your existing staff and consultants, as well as leaders in franchising, as you make these changes.